Clematis is a colorful climbing vine that features 4- to 6-inch flowers in white, red, red-violet, blue, purple and yellow. According to the University of Nebraska, it is also known as the "queen of vines," and with reason--left unpruned, it reaches heights of up to 30 feet to brighten up a wall or fence, provide privacy or serve as a focal point in a garden. For companion planting, select flowers with the same sunlight and soil requirements so the plants complement each other. Clematis is derived from the Greek word "klema," which means a vine branch. It belongs to the buttercup family, along with anemones and peonies. The vines have been cultivated since the 16th century. 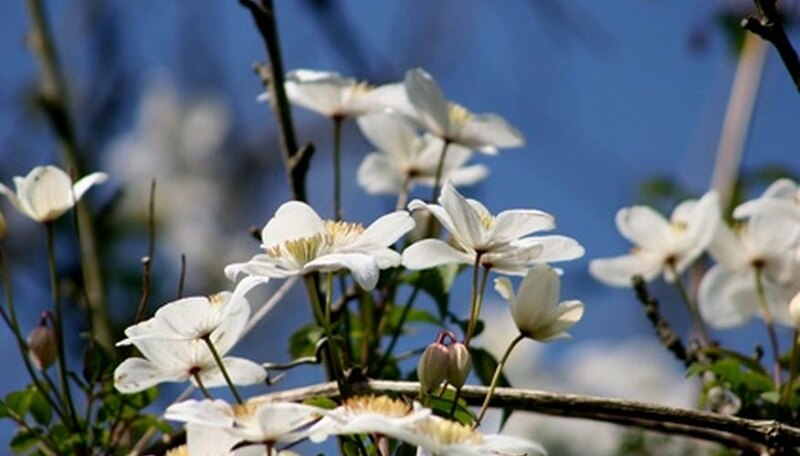 Clematis features more than 100 cultivars and 290 known species. While some cultivars are easy to obtain, others are rare and considered a specialty. Clematis prefers well-drained, sandy loam soil that is slightly alkaline and packed with organic matter such as compost or well-rotted manure. Although the vines require at least six hours of direct sunlight and good air circulation, there are some varieties that grow in partially shaded areas. It is essential that the roots are kept moist and cool, which is why many gardeners grow perennials around the base of the plant. Since clematis vines prefer a rich, well-draining soil with organic matter and a higher pH than normal, azaleas and rhododendrons are suitable for companion planting. Ray Bosman, in the publication Maryland Home & Garden, suggests planting the two shrubs with the colorful vine. Climbing roses are another compatible plant to grow along with clematis. Rose vines provide the necessary support for clematis to grow on while shading the roots and keeping them cool. According to the University of Washington's Botanic Gardens, the pairing of both types of vines provides varied color and shape and enhanced interest in the particular spot. Grow daylilies with clematis vines planted in direct sunlight. These hardy perennials are easy to grow and maintain, and the orange blooms complement purple clematis varieties. Dusty miller with yellow blooms is another plant suitable for companion planting because it provides clematis roots the necessary shade they need to keep them cool. The marigold is another orange flower that is compatible with clematis vines. Plant lobelia next to the clematis if it grows in a partially sunny or shaded area of your garden. With blooms in different hues of purple and yellow, it spreads around the base of the clematis without disrupting the roots and keeps them cool to some degree.